Mr. Qayyum Khan was an elected local government representative in Dhaka constituency surrounding the military base in Dhaka. A few politicians have been arrested during the first hours after the military takeover on 11 January 2007. Mr. Qayyum Khan was one of them. Since then for the last 13 months, the authorities have kept Mr Khan in custody without even any charges made, forget about conviction. Although highcourt ruled his detention illegal and he was forced to be released on 10th January 2008, he was immediately arrested at Jail Gate. No specific charges were not made this time also. After being detained in Jail for 13 months without any trial and charges, Mr. Qayyum Khan finally came out last night. As a dead body. Mr. Khan died under custody. I would say he was killed, directly or indirectly. Both print and electronic media are made to tell that he had a stroke in jail cell and died in hospital. Hospital sources are saying very clearly that by the time his body reached emergency department, Mr. Khan’s body started to show rigor mortis. Same day, in a very well coordinated move, government arrested BNP ex lawmaker Mr. Alal from his home. As a reason for the arrest the press was told that he was planning to break the laws of emergency rule by meeting with some people in his home! And our grand post 1/11 independent judiciary immediately granted 2 day remand to let the DGFI beat the hell out of him for resisting Mannan Bhuiyan takeover of BNP. This coordinated move is meant to be a clear threat to Delwar and Rizvi, “if you don’t want Mannan, Goyeshwar Roy take over, you will first face Alal’s fate, then face Qayyum’s fate”. How can people not see the sheer outrageous crimes of the government? The forces are raiding peoples’ homes and arresting them with charges like “they were planning to break the emergency rules”. In this kind of blanket excuse, this government can pick up anybody. No one is safe. And then lets talk about the remand! Every time people tell me what great things this government did by separating te judiciary, I feel like throwing up. We are told, “What I don’t want from pre 1/11 are the destruction of all of our key democratic institutes by manipulation, the graft, the cadre based mastani, the destruction of the public administration, judiciary…”. How better is it from then? If government already knew Alal was planning something, why remand then? Do anybody want me to believe that the judge is working freely? I saw TV footage of Qayyum Khan’s home. Another typical middle class Dhaka home in a middle class neighborhood. Very modest, the same kind where I grew up in. No million Taka interior decoration, no hanging Picasso painting, no duplex living room with water fountain-chandeliers, like those we see when some of our civil society leaders and current government advisors give thoughtful interviews to TV. 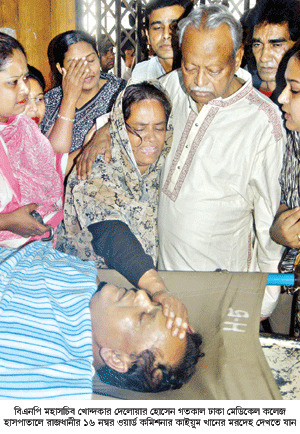 When they were talking to Mr. Alal’s wife, it was again an ordinary Mohammadpur flat. Very modest middle class look. And we have all along been told these people stole whole of the country. Where are the charges? Where is the stolen money? Qayyum Khan spent 13 months in jail waiting to know what his was crime. And government could not even show corruption as a cause of Mr. Alal’s arrest. The reason in his case was so called imaginary violation of rules of State of emergency. Although Mrs. Qayyum’s Khan’s wailing was very intense in TV, I am pretty sure; her wailing will never reach those who make a living out of human rights issues. There will not be any urgent action alert, no statement, no blog, no facebook group, no burning of conscience. If you are a detained university teacher’s wife, a minority leader, a journalist, you are a human. You will be heard , you will be spoken of. But these Qayyums, Alals, Tareqs are inhumans. Human rights watchdogs don’t talk about inhuman rights. Inhumans don’t have right. There is nothing like fairness in Bangladesh. Bunch of traitors, liars and hypocrites are ruling our beloved country. State of emergency rules have become a matter of choice. After this, how could odhikar president Hasan Arif become an advisor. According to Navy and DGFI hasan Arif was involved in anti-state activity. Illusions are all gone. Economy is in shamble, human right abuse to the extreme. Justice system broke down, businesses are down. These mad people went to point of no return months ago. They will do anything to save them. Intimidation, jailing didn’t work. Killing begins and it won’t work either. Peoples mind are clear & set. They will take charge. Terror group DGFI will be nonexistence. I am waiting for some people to join this discussion with the claim that Bangladesh is now passing through one of glorious parts of her history. Rizvi Ahmed is next. If this regime reaches Rizvi Ahmed anyways, then I guess bloggers will be next to him for sure. My friends, the Holy Koran has told us that when people purposefully decive themselves, it is as if they put seals on their ear and eyes. We can not make them see what they will not willingly see for themselves, nor hear what they will not willingly hear themselves. What can we do? Only what is in our capabilities, to raise these issues at every chance we get, to appeal to other people’s conscience and humanity, and finally and most importantly, to emblazon these lessons in our own hearts and minds, about how these men and women are dying and suffering for us; let us never betray them and this cause. Get Ukil Abdus Sattar ready. After long time, you have wrote. Thanks a lot. The fact’s is really sad. Another satanic voice has come over. Barrister Amirul Islam, a delusional traitor. I think he now desires to be one of this regime’s counsels, or this regime has chosen him as one. Why is he here? Isn’t D. Kamal seemed enough to this regime? But whatever you say, Barrister Amirul Islam can be a good replacement of D. Kamal for this regime, more transgressive type. Recent movement inside Dhaka University regarding various student wings, is a very positive sign of a major political alliance of BNP & Awami League in long run (like what happened before Ershad’s kick-out). As a result, this regime has made a move very prudently. They have possibly set Barrister Amir, who has already a political vehicle, Awami League. Now, he will demand major reformation in legal system. Apparently or visibly this will seem to people as an honest demand. But this demand is ultimately an initiative of putting BNP’s last 5 years rule into another controversy. All these approaches of Barister Amir will thrust all possibilities of BNP-AL alliance in long run. Now you will see, Barrister Amir’s statements and political analysis will get mere importance in PA & DS. Because this regime will say some words through the mouth of Amir and will want people to listen to those. So, profoundly, I don’t think this regime has a desire to use Jamaat as a political vehicle, as tacit said. this government have to maintain the international standard of human rights. that his government is taking care of human rights. that this government is very conscious about human rights. Qiyum Khan, Badda’s Ward Commissioner and once Deputy Mayor of Dhaka is killed after 13 months illegal detention inside jail. Being a patient of heart problem & high blood-pressure, Qaiyum Khan was not visited by a doctor for a single time in these 13 months. No human rights watchdog, no “shushil shomaj”, no TIB, no Amnesty Intl., no Irene Khan will make any speech about the brutal human rights violation that this regime did to Qaiyum & his family. Many of us will keep posting in categories like “say no to military rule”, “democracy” etc. But may be there won’t be anymore post published regarding the murder of this publicly elected ward commissioner. This will only be Khandoker Delwar Hussain and some others of BNP, who will have to take care of Qaiyum’s family, because they don’t earn their living by having their consciences sold, they are less taught to forget things. Your blog is turning into full partisan pro BNP. Nothing wrong with that, but let’s call the spade a spade. Niropekhotar mukhosh kholen. Rumi Bhai does not recognize Saifur Rahman as the chairperson, neither recognizes Hafiz as the General Secretary. According to the EC, this is the real BNP and the court is going to do so in near future, isn’t it? Rumi Bhai don’t recognize the “peer-shaheb” (EC) preferred faction. So, how this is a pro-BNP site. In fact according to this government, this is an anti-BNP site. The army-backed government is losing credibility by committing the brutal killings of Cholesh, Qayyum, and the likes. People were their strongest support, which already thinned out a lot due to the sky-rocketing prices and mockery of free judiciary. If this government think people will never turn their back on them, then they will be seriously mistaken. People welcomed them because we did not want to go back to the sky-rocketing prices of the past government, the extra-judicial killings in RAB corssfires, the impunity of the party cadres of the past governments, the unbounded greed for power and money of our politicians, etc. Time is running out for this government to correct itself. Ultimately, its the people who loses everything. This is a result of their high optimism about this present regime. And their high optimism is a result of the usual/unusual political imprudence of these people, who are delusional apart, and have unconsciously urged Bangladeshi people to abandon them. Or another reason that is also considerably possible, is, may be this apparently “good for nothing” group of people now wants to some attention or gracious-look of this regime. Foolish people! But I guess there is no chance to dam care these men because most of troubles on this earth have been caused by foolishness of people. I just hope Khandaker Delwar Hossain’s and mainstream BNP prepared its succession plan. Desperation has sunk in within interim entity dual power base. As events unfolding, godfather(s) of this interim entity, from both end of Atlantic trying to prevent a full fledge army take over. I second M. Amin. Begum Zia could not implement a contingency plan right after Jan 11th and there was a lot of confusion in the party. Let’s not make the same mistake this time. What happens if Khandokar Delwar Hossain and/or Rizvi Ahmed is arrested? If they arrest Khonkar Delwar Hossain, who they will force to submit to Mannan Bhuiyan? Arresting Delwar will not solve their problem. And if they arrest him, someone will stand up, Sohel, Ripon etc. The only way govt plan will work now if they can somehow manage to make Khaleda Zia urge Delwar to accept the DGFI factions demand. Barrister Khokon tactic was not probbaly a robust effort. Now they can have Khaleda Zia send a written order, or bring her to court and have her talk to media from the court. I feel one of her daughter is laws may need to publicly support Delwar Hossain now. That will take the last breath from Saifur-Mannan-Hafiz clique. Rumi Bhai, that’s a good plan. But let’s keep Khaleda Zia’s daughter-in-laws out of it as long as possible, for the sake of BNP, and Begum Zia’s grandchildren. Also, it has to be Zubeida Rahman, not Sharmila Rahman. BNP is too easy a target in this passive mode. All the leaders are being plucked out and processed by the DGFI one by one. Khandokar Delwar and his associates are under tremendous, inhuman pressure. A pressure valve badly needs to be created somewhere, somehow, to relieve some of this pressure. Hannan Shah freed on bail. Ar Hafiz is waiting for a ‘phone call with instructions’. Hasan Mashood finally ‘admitted army being corrupt’. is a good sign? or bad? I personally think, there is no sign in it. HC’s quash order over Hasina’s case has already brought “prochondo bhata” in ACC’s work. HMC just wanted to cheer it up a little bit. And if then ACC drive really starts working over Army… this will be just a house-cleaning effort for this regime… you know… a process of disarming anti-loyalist military officers. So the fraction starts within army. Good! No good soldiers can ever support Moin and Mashood like. Moin, Mashood and many other already sold their soul to foreign investors. Exactly. Many of us often confuse about the whole idea with the Bangladesh Army and this regime. This regime is the brainchild of some civilians along with some key people of Bangladesh Army, who gave birth of their own agenda and are now trying to implement them under cover of a government which is at 100% backup of military high command. I said the high command, even not the total of it I hope. This regime has no such stance which can be supported by the whole army. So the fraction inside is not absolutely impossible. HMC told ACC drive over the military. If he’s really meant it, then this will be just a anti-loyalist removal process, which will be I guess the most fatal mistake of this present regime. Moin has no business visiting India, an unfriendly state of Bangladesh. We could have brought rice from Myanmar. We can thwart Indian influence, and we will. History judged Ershad a bad dictator and rotten scoundrel. Moin will be judged as present day Mir Zafar. Next civilian Government must take on DGFI and so called intelligence unit. 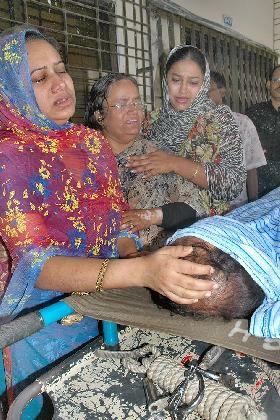 They MUST be held accountable to the CITIZEN of Bangladesh for their crimes. Bangladesh doesn’t need these shadow intelligence who are serving their foreign master in covert operations. After the mysterious death of Mr. Qayyum, I am very mucd scared about Mr. Tariq Zia. Perhaps, they are conspiring to kill him or cripple him. If they fail, they may do it in the most heinous way to some of the potential leaders like TZ as happened on 3rd Nov 1975’s nightmarish night where 4 national leaders were killed in jail. May God guide the nation and protect us undoing all the conspirers’ all ill designs and conspiracies. I’ve argued against the simplistic notions about dynasty politics in UV – if the party rank and file needs Zubeida Rahman then so be it. But wellwishers of BNP need to have a long and hard self-reflection about the party when a Zubeida Rahman is needed to keep things going. In fact, notwithstanding the great job Khondkar Delwar Hossain has done, the same self-reflection needs to be done about him – he was a relative no one when the party was in power. We’ve discussed these in Tacit’s blog some weeks ago. One could argue that ‘this is not the right time to have these reflections – Moeen has to be fought etc etc’. Perhaps. But I fear the discussion will be then put off because of imminent election campaign, and then in the post-election horse racing etc. It’s never a good time to have these discussions, but it’s never too late either. Well, Jyoti Bhai, I don’t think there’s anything wrong with the questions you raise. In fact, for a lot of us forced to sit out of this current battle, self-reflection and introspection are about all we are good for right now. Would involving Zubaida Rahman be somewhat unusual? Certainly. It would also put the three little children (Tareq’s and Coco’s) at some risk, which is why it would only be a final step. But think of it this way. This government has primed itself to arrest anyone and everyone who can speak for BNP. I think what they’re doing for Hannan Shah speaks for itself. If instead of being Chief Whip, Khandokar Delwar Hossain had been a cabinet minister (although the two posts have the same status and rank), he would also have been in jail now, facing some ridiculous extortion charge or simply in detention. Ideally and ordinarily, this is not how BNP should operate. But, as we are made painfully aware, these are neither ideal nor ordinary times. Also, I think we should avoid the mistake the military regime has made: reducing our problems to just people. Moeen is not the problem, he is only the visible symptom of the problem. And long after this government is gone, we will need a continuing social movement to ensure that the lessons of the past twelve months are not forgotten. Is it possible that Hannan Shah knows something that could cause troubles to anti BNP fraction? Definitely, there is something about Hannan Shah that is causing the reformist faction of the BNP to panic, and panic badly. It may be that there really is supposed to be some kind of polarization in the next few days, which is why it is so critical to keep Hannan Shah out of the picture. Because, this is definitely a stopgap measure; they won’t be able to keep him locked up for too long this time either. Facists has lost and became mad dogs. They may come with ‘chamaks’, but none gonna help. All chamaks are valuless. There are no mystery excpet more facist actions. A recent article in Dinkal posted under UNB as source, kind of favored unification process. I guess there has been a tremendous pressure to have mainstream BNP sans Khaleda family participate in the upcoming election. In addition to pressure, now the other fear mongering i.e. AL is coming to power, is being used. A quick visit by Hannan Shah to Delwar’s place and closed door meeting in the presence of Nazrul Islam Khan ( Possibly the DGFI liasion in BNP) confirms the suspicion. With no sign of popular uprising in the horizon, there is a limit to the torture this brave leadership can bear. Amader Shomoy has been beating the ‘Tarique will compromise’ and ‘Jatiyotabadi moha front’ drum for a while. Now Prothom Alo has joined the ‘Jatiyotabadi moha front’ bandwagon. And when you think seriously, it does make sense. Whether one likes it or not, Awami League is determined to join the election. If the Jatiyotabadis (read anti-AL) is not organised, AL will win. Grassroot might have found it emotionally hard to betray Khaleda and her sons, they may have had a strong aversion against the army takeover, but the impending threat of an Awami win is probably enough to join forces. The question seems to me is no longer whether the wall will crumble. It probably will. They question seems to me is ‘who will lead the jatiyotabadis’? Jyoti bhai, I would actually be comfortable with a situation where AL goes to the election and BNP stays out. If AL does win, it will allow the military regime to hand over power, herald a return to democracy. If BNP can stay out, and let Mannan Bhuiyan, Hafiz, and Saifur create some sort of a front with LDP, Bikolpo Dhaka, and JP, it will permanently discredit those leaders and lead them to political wilderness. Let’s also start talking about the elections. Will we seriously have to have elections with emergency still maintained? While the only point of the emergency is to keep people locked in? Why should we have to settle for such an election? Even in Musharraf’s Pakistan it is hard to rig an election and engineer a win if the public is against you. We shouldn’t have to ‘settle’ for an election under emergency. We should take the election as a challenge and beat the regime in its own game. After all, the 1970 election was also held under martial law. But the question is should the opposition hav gone for elecion if Musharrah somehow kept Benazir (zardari)and all senior leadership in jail, virtually disqualifying them from participating functionally and made a lose qualition with newaz and other small fractions? Still BNP should take part in election if the party can use their symbol and at least some leadership are allowed to campaign. If the election is going to be without BNP participation then let it be because the regime bans BNP, not because BNP boycotts it. I get both your points about the dynamics of the election participation. So Rumi bhai and Jyoti bhai, what should be the minimum conditions for BNP to participate in the elections? What happens if the government lets the other BNP faction take the paddy symbol, and disqualifies every BNP leader now in jail/in hiding from running? Tacit, if the government gives Mannan-Hafiz the symbol, and disqualifies every Khaleda-supporter from running because of some trumped up charge, then how is that any different from banning BNP-Khaleda? This is my point: let the regime make that decision. BNP-Khaleda (and for that matter AL) should participate until they are effectively forced into not participating. On symbols, sometime last year there was a discussion in these pages involving Rumi bhai, Mash, Asif Saleh and myself. Rumi bhai presented an example where a dedicated long-term BNP local leader was dropped for a newbie in 2001. The newbie was reputed to be a Hawa Bhaban favourite and won favours during the last government. But now this guy has joined the ‘reformists’. The old-timer however has remained true to the mainstream. Suppose the regime gives the newbie dhaner shish? I think the old-timer should still contest. Let the regime lock him up. I do realise the irony of sitting in front of a computer in the comfort of my lounge in the safety of the west and typing ‘let the regime lock him up’. But then again, the alternative of andolon is no less ironic. The alternative (andolon) is worse, BNP understands that. And the regime also understands that too. So regime (The surrogate is EC here) knows that they can do a lot of discrimination to BNP before forcing them out of election. I feel they want a BNP boycott. Shamsul Huda is making all the gestures in that direction. But maybe they don’t have to disqualify every BNP leader. I think there are about sixty-eight former MPs who are at least two time election winners between 1991, 1996 and 2001. If even forty of these people can be barred from running, that will ensure a BNP loss and that some of their best parliamentarians are kept out of the picture. So if AL and BNP are both committed to the election, that completes the guest-list for the elections. Given a scenario where AL is the largest party with about 120 MPs, BNP has about 80, JP 15, Bikolpo Dhara 5, LDP 10 and Jamaat 10, and the current regime has about 50 MPs beholden to it. I suppose the trick then will be to ensure that there is no BNP-AL tie-up. In other words, this regime has to ensure that the results are so fractured that no party can form a government without the MPs loyal to Moeen. Funnily enough, that’s what Amader Shomoy has been predicting for the last few days. Tacit, if the final tally is something like what you have (or variations, with both AL and BNP comfortably beating the King’s Party’s 50, JP-BD-LDP 30 and Jamaat’s 10), then whatever the final government is, it won’t be a King’s government. If AL or BNP is the senior partner in a coalition, I don’t think it will be MPs loyal to Moeen who will call the shot under the current constitutional arrangements. And if either AL or BNP can get over 100 seats, their support will be needed to amend the constitution. Bottomline: Moeen cannot win the election game unless he has a solid deal with either AL or BNP. And by AL/BNP I mean the mainstream party with active support of the respective netris. Given this, it would be a folly for AL/BNP to boycott the election. Thank you Jyoti Bhai. Please go the next step and tells us what you think are the scenarios under which Moeen may be able to persuade BNP over AL to ally with it, or the other way round. Well John as always you write well, and you have good intentions, BUT I think even though the case of Moudud Ahmed is very sad—–no due process for an ex law minister—–the irony!, you have to understand the background of the country, and the over all situation/HISTORY. This is not a justification of his poor treatment, and at a personal level I do not know him, or his life history, but an attempt and explaining the deeper wider issues which finds him in such a sorry state. First Bangladesh is a British managed puppet state—–and most of the leading political actors from the BNP, Awami League head to London for their political approval or policy ideas, or to invest their loot taken from the poor people of Bangladesh. A good deal of the state structure is also trained by the British, most notably the army, where each year the best cadets from the army are sent to train at Sandhurst. So the military elite is British orientated. Also lets not tut tut righteously, and say quietly to ourselves that this is another case of a Third World banana republic being brutal to its own—and shrug. As with the above point we should ask who controls the local Third World actors who does these things? To what extent is the brutality in South America, Africa and Asia the manifestation of local actors or the hand of Western corporations and government agencies? As to Britain, what it has done in the UK, most notably in Northern Ireland and in other instances, such as in Iraq and Afghanistan is far worse than what the military regime in Bangladesh is doing, or has ever done. The Bangladesh military is disciplined, and the country does better under military rule. I myself tried to practice as a Barrister in Bangladesh in 2002, in the Chambers of Tawfik Nawaz? Well known and clean Barrister. I experienced many many difficulties, as a result of which I had to leave the country eventually—-the BNP was in power then, and the British were as active as ever. The people of Bangladesh must eventually find their ‘freedom’ from the clutches of the British neo-imperialists, and the genocides exacted by that imperial power upon the poor wretched people of that country and region. You have done great work for Bangladesh and her people, and I honor you for that. But permit me to educate you a little about the wider issues, which finds the country in such a state. * The ‘Black hole of Calcutta’ 1757 incident falsely used by the British to justify their conquest of India—–‘The dreaded Bengaali’ ‘The evil conniving slippery Bengali……’ ‘The Bengaali Babbu know it all’ mainly directed as Hindu Bengalis. * The history of British rule in Bengal started off badly and only got worse. Bengal was the ‘Pearl of India’ in the eighteenth century, and only after 50 years of British rule, after they had plundered it, it became the poorest state in India. In 1769 in order to grow cash crops like Indigo and jute, farmers were banned from growing rice, and as a result 10 million people died—-Warren Hastings was taken to trial for this but was cleared. Misrule continued in the nineteenth century and into the twentieth century. In 1943 just when it seemed the Japanese were about to Invade India from the East, the British surrounded the state of Bengal, passed laws prohibiting rice imports from surrounding states, sent agents to buy up the rice in Bengal and ringed the state with police and paramilitaries to forcefully starve and kill 3-6 million people, and thus keep ‘control’ of the state——on the assumption that there ‘might’ be rebellion. You understand the callousness and paranoia of the Raj. * The British are color averse, speaking as one who has grown up in the UK. Most Bengalees are brown to dark brown people of Indo-Burmese stock—80%, 20% Indo-Aryan. Racism defined British rule in Bengal, and still does. It is no coincidence that the British empire entirely involved subjugating and exploiting people of color. * Britian is an Islamophobic country traditionally—Crusades etc. It becomes more Islamophobic with the Jews of London and their control of the media, and the creation of Israel. * Bengal was the first major Indian state to experience British rule. With it came Western ideas and knowledge. Put together this with Brahmanical education in high caste Hindus, and what you had was a major advancement of high caste Hindus taking advantage of Western education, and fusing it with Indian knowledge, from the eighteenth into the nineteenth century. Thus naturally these new breed of educated Bengalis become conscious of themselves and they spear headed the intellectual drive for independence. The political class for India’s independence was dominated by Hindu Bengalis, and it irritated the British no end———just another evidence of the ‘dreaded Bengaali’. The Bengaali Hindu political class defeated early British efforts to divide the state of Bengal along religious lines–1905—–1912. After the British created the Muslim League in Dhaka, East Bengal in 1905. The British in a huff in 1913, took the capitol of the Raj from Calcutta to Delhi, as far away as possible from the ‘dreaded Bengaali’. * 1857 Indian Liberation war. Of the three armies of the Raj, which controlled India, it was the 139,000 strong Bengal Presidency army which rebelled and fought the British. There after Bengalis and especially Brahmins were banned from being recruited into the Raj army. The Liberation war created further animosity, as there were wide scale fighting and extreme brutality by both sides against armed forces and civilians alike—–Severe British brutality against locals and harsh police tactics, similar to those of the Ulster constabulary continued right up to independence in the states of Bihar and BENGAL—two of the most impoverished states of India, and areas of continued rebellion even now by Naxals–it has become part of the culture, inherited from the British. * From 1919–1947, there was renewed armed struggles by armed groups of Bengali fighters against the British. In that time two British governors of Bengal were assassinated, along with many civil servants and police. * The great Indian political leader from Bengal Subhas Bhose who advocated Indian independence through armed struggle, with foreign assistance appeared on the Burmese border in 1944, with an army of 40,000. They were defeated by the allies, but the psychological effect on the British and Indians alike was tremendous, and one of the key factors the British judged it was time to leave India. * The British as part of their divide and rule policy created many frictions in Indian society. One of these was the creation of prejudice and friction between states in India. They deliberately propagated the image that Bengalis as sly and not be trusted. Things associated with poor character. This had adverse affects after independence when the Punjabi dominated government of Pakistan took over, where the majority of the people of the new nation of Pakistan were ‘Dreaded Bengaaalis’ 56%. And so this artificially created state by the British just couldn’t gel, and whilst Bengalis couldn’t become leader of overall Pakistan, they couldn’t even become leaders of their own part of the country—–continuation of colonialism. When the Punjabis finally left East Pakistan in 1971, they left with a vengeance, not something one would characterize with true fellow countrymen and fellow Muslims. The British had educated the Raj army well. See the performance and behavior of the Pakistan army in Baluchistan and FATA. * …………there are other stufff…but its a bit out there……..
* The very first governor of East Pakistan was a British Civil servant, because the political leadership of the country was marginalized, or not allowed entry from India, whilst the British consolidated their new artificially created country—Pakistan. * Then West Pakistanis ran East Pakistan like a colony, with all its heads being non-Bengalis, right up to 1971. This is stuff you are well familiar with, so I won’t go over this too much except to say that during British rule of the sub-continent, they encouraged differences between the various states. So the ‘marshal race’ Punjabis who were recruited into the Raj army were indoctrinated into hating/looking down on Bengalis. * Then there was the 1971 war, and all the devastation that came with that. * The 1971 December 13th massacre of the 270 Dhaka intellectuals of professors, journalists and artists seems on the surface like a ISI covert op. using Islamic fundamentalists nutjobs, but when you look at the issue in greater depth (Channel 4 did an excellent documentary on this event in 1997, and I encourage you to watch it) it looks like the orders came from the ISI masters in London. Most of the Islamic fundamentalists who did the dirty deed, including their leader went on to live in London, and ran a Mosque in the East End, until the channel 4 program exposed them. The leader of the group, Moinuddin Khan was invited to 10 Downing street and shook hands with the PM, John Major. I hope John you do a thorough investigative report of the links between the British state, with Islamic fundamentalists going back to the last century, and how local intelligence agencies use such people, in Third World societies. It ties in with Australia, especially under Howard. * From 1972-75 Bangladesh went through a very difficult period of destabilization, and an eventual coup, backed by the USA overtly, and the UK covertly. John I don’t know how much you are into elite ‘conspiracies’, but if you are into the NWO thing, and that the Rothschilds of London are the main operators, and people like Brzezinski and Kissinger their tools, then you will understand the picture of why Shiekh Mujib ur Rahman was invited to the UK in 1975, and then upon his return when all the pieces for the coup were set, the army massacred his entire family including a child of a few years. That just about sums them up doesn’t it? Without being too narrow, if you really are into explaining the problems of Third World societies then all you have to do is look at the ‘The City’ and the Rothschild’s, whilst developing a strong conscience saying that ‘I’m not anti-Semitic’—-merely objective, looking at cause and effect. * Then General Zia ul Rahman.1975–81……………some stability and development. He himself was not corrupt but he did out of insecurity allow corrupt men into his cabinet—-setting a bad example for future democratic governments. He armed and politicized the students unions—very very dangerous. He allowed British military trainers into the country after an absence of 30 years in 1977—-unforgivable, on the advice of the Callaghan Labor government! He focused development of the nation on a Western model not suitable for Bangladesh from the 1950’s, when instead he should have invested heavily into infrastructure; education; export and industry—-in addition focus on institution building of the bureaucratic center—strong anti-corrupt efficient state institutions—-the secret of Singapore’s success, and not democracy. He squandered the huge amounts of help the Carter administration gave him—maybe we should not expect too much from a military man with minimal education. Relations deteriorated with India during his tenure. He was invited to the UK on a state visit, whilst in the UK the pieces for the coup was fixed by the UK, and he was killed upon his return in 1981 by the UK. Indira Gandhi partly got the blame! * General Ershad 1982-90. Not corrupt, built up the countries infrastructure, and some development took place. He was a womanizer, but not a major problem all things considered. Lost power in 1990, after a popular uprising. * Since then we have had the two women, in democracy constantly bickering about the past, with no real development. Obviously Bangladeshis can’t go through history blaming their national problems on the British significant as it has been, but sooner or later they have to take matters into their own hands. With a population of 150 million, rising to 300 million by 2050, sooner the better.